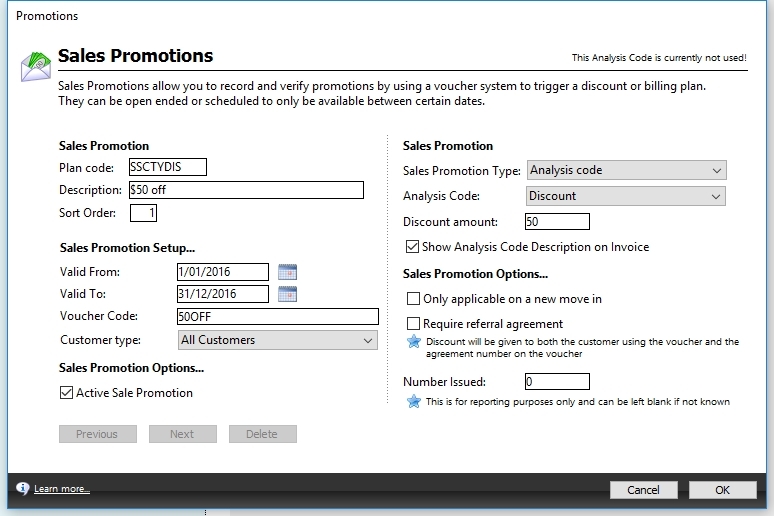 Sales Promotions allow you to create and customise special offers by using a voucher-code system to trigger an analysis code or billing plan discount. Sales Promotions can be ad-hoc or scheduled to only be available between certain dates. By setting up different promotions and reporting on them, you can track which marketing campaigns have been most successful for your business. Open Sales Promotions by navigating through the Maintenance menu. Enter the details of your promotion. Promotion Type: The type of item this deal is applied to. Select OK to save and close your new promotion.